The following is a brief summary of the 2017 History Detectives session "Grand Rapids Mid-century Park-School Development Program" presented at the Grand Rapids Public Library by Pam VanderPloeg. Text and photos copyright 2017 unless otherwise noted. Special thanks to Melissa Fox for her part in researching this important history as former Special Collections and Local History Department Librarian, Grand Rapids Public Library. Grand Rapids has a unique collection of mid-century modern park-schools completed between 1951 - 1962, the first phase of a major construction project funded by a Grand Rapids Public Schools Millage approved in 1951. The schools were designed to be child-friendly in their size and design. This is a finite group of modern schools in expansive park settings, and it is fun to imagine what they must have seemed like to families when they were first constructed in that time of post-war optimism. 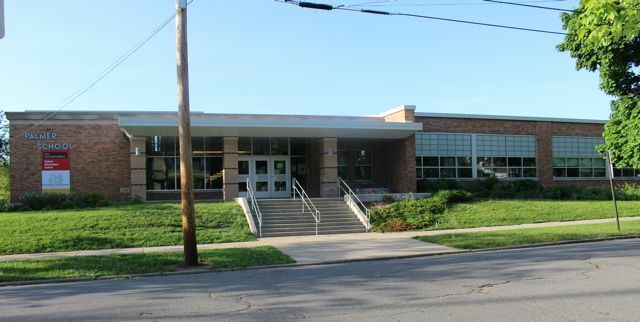 During the post-World War II baby boom years, Grand Rapids Public Schools were in desperate need of building maintenance, new classrooms, and revenue. The schools, which flourished during the period from 1909 to the 1920’s in the era of school architect Henry H. Turner, had fallen into disrepair. Looking for a comprehensive needs assessment, the school board commission a survey by the University of Chicago's Field Service team who visited the city and reviewed the condition of all of the schools. The completed report called for a complete overhaul of the existing schools from painting and new specialized classrooms to better lighting and new playgrounds and and the construction of new elementary an junior high schools. Based on the results, the school board launched a campaign they called “SOS - Save Our Schools, and convinced voters to approve a 20-year building millage. At that time, Grand Rapids City Parks Superintendent Fred See, an accomplished landscape architect whose career began in New York City, proposed an innovative plan modeled on successful programs in other cities, collaborate with the schools to put the new buildings in expansive neighborhood parks. The result was an agreement between the City Commission and the Grand Rapids School Board that is still in effect. To design the much needed schools, the agreement called for a committee of architects to develop common solutions to the design challenges identified in the University of Chicago Report. The general solutions/design strategies were coupled with the school board’s mandate avoid "cookie-cutter" schools. Each school was to be designed with an eye toward the neighborhood identities and typography. The unique mid-century schools designed in the first phase are shown below in order First row left to right Mulick Park, Hall School (gone), Madison Park (gone). Second row left to right Riverside Elementary (repurposed and changed), Brookside School, Kent Hills School. Third row left to right Maplewood School (repurposed as Habitat for Humanity), Westwood Hills, Ridgewood Junior High (now Ottawa Hills High School). Fourth row left to right Hillcrest School (now a charter school), Palmer School, Riverside Junior High. Fifth row left to right Campau Park (now a charter school), East Leonard, Crestview School (now Northpointe Academy) and Sixth row left to right Shawnee Park (now Grand Rapids Christian Middle School), Buchanan. The GRPS Service Center (demolished to build I-196) which was part of the first building phase was torn down for the new I-196 Highway. 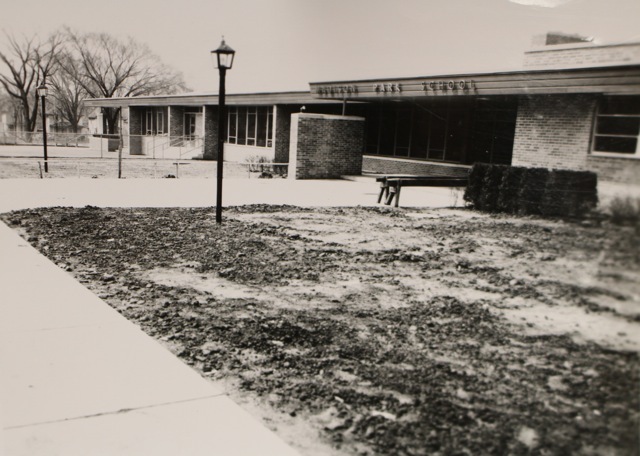 The following gallery includes vintage photos of Mulick Park, Brookside, Campau and Riverside and Madison Park schools built in Phase I and the playground at Harrison Park, an older school that was renovated. Mulick Park steps lead down from building down to the various age-appropriate playgrounds. Photo Courtesy of City of Grand Rapids Community Archives and Research Center. The Mulick Park-School model was created by the City Parks Department. Fred See, Park Superintendent, the man who introduced this idea to the City Commission and School Board, brought the model to the convention of the American Landscape Architects and won first place, the blue ribbon in 1955. Photo Courtesy of City of Grand Rapids Community Archives and Research Center. As part of the Park-School Development Program, older schools that were not replaced received new park-playgrounds. This drawing by the City Parks Department shows a beautiful park with basketball, baseball and tennis courts. It has areas for recreation activities as well as and track and field area. Photo Courtesy of City of Grand Rapids Community Archives and Research Center. This Parks Department utility vehicle parked at Harrison School in the 1950's is ready to work on the new park-playground showed in the schematic drawing in the previous Parks-Progress photo. Photo Courtesy of City of Grand Rapids Community Archives and Research Center. Lighting and shaded benches were special features at new Grand Rapids Park-Playgrounds surrounding the Park-Schools in the development of efficient year-round park-playgrounds designed for all ages. Harrison Park-Playground. Photo Courtesy of City of Grand Rapids Community Archives and Research Center. Campau Park School was constructed in the middle of a beautiful but declining older park off Division that was once the Antoine Campau farm. This photo taken in 1959 shows students enjoying the basketball court with the new school in the background. Campau Park-School playground already had this awesome pool for the neighborhood children to enjoy. 1959 Photo. Photo Courtesy of City of Grand Rapids Community Archives and Research Center. The City Parks Department added this wading pool to the Campau Park-School playground. Photo 1959 - Courtesy of City of Grand Rapids Community Archives and Research Center.